At COA, volunteerism is the thread that binds us together and allows us to carry out our mission. 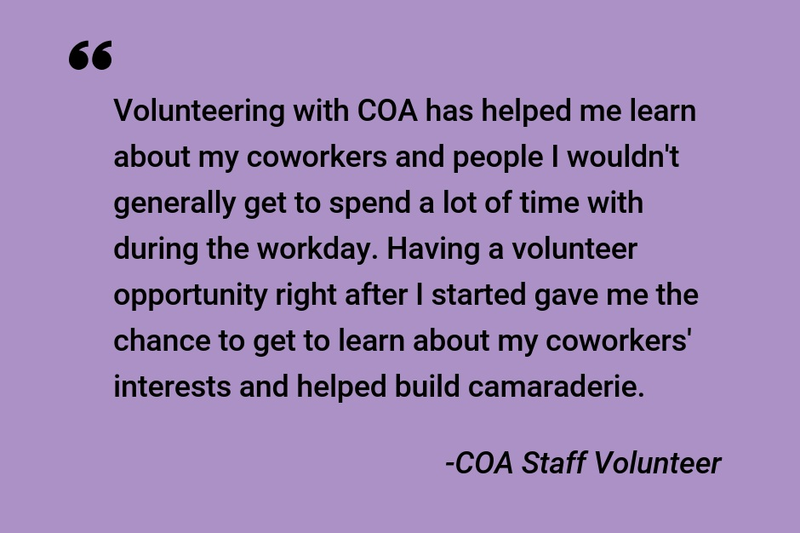 Whether volunteers are helping our accredited organizations or running our site visits, COA would not function without them. This is why we like to pause every April to celebrate National Volunteer Month. Established in 1974 by Presidential Proclamation, National Volunteer Month aims to both celebrate volunteers and unite the nation in increased volunteerism throughout the month. According to the Bureau of Labor Statistics, over 62 million Americans volunteer at least one hour each year, with the average amount of time equaling to approximately 50 hours per person (that comes out to about 3.1 billion hours of donated time!). Previously we have acknowledged Volunteer Month by writing about starting a workplace volunteer initiative and had a guest post from one of our many wonderful volunteers. This year, we decided we wanted to get a bit more personal. How does COA staff connect with our own volunteer initiatives? What impact does it have on the communities we serve as well as our own? What can others learn from our story? In 2012, COA staffers spent a day on Staten Island, cleaning out a home affected by Hurricane Sandy. The devastation was sobering. It helped us to realize that we were eager to give back outside of our day-to-day work. This led to the formation of an interdepartmental group to spearhead employee volunteer opportunities, now known as the COA Volunteer Committee. Since its creation, the committee has coordinated drives, off-site activities, and in-house events. The committee kicked off its efforts in 2013 by participating in “Repack in Hunts Point” with Food Bank for New York City during National Hunger and Homelessness Awareness Week. 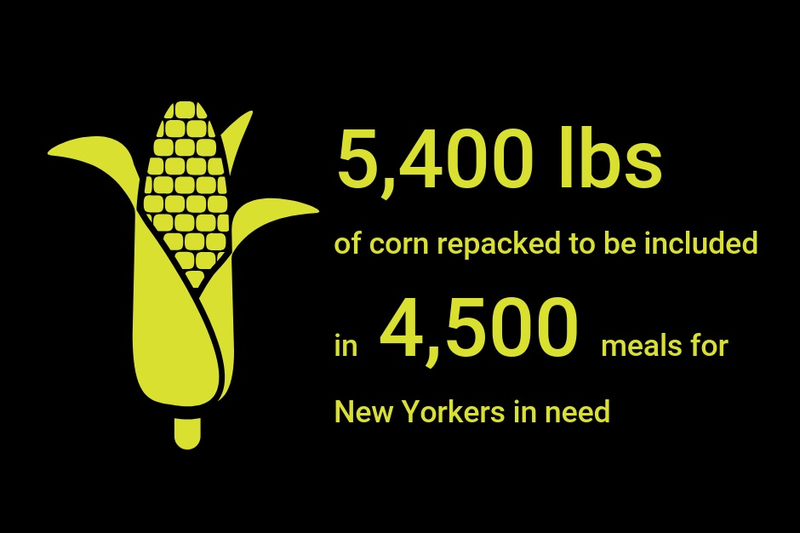 We traveled to the Food Bank’s Food Distribution Warehouse in the Bronx and were tasked with sorting, weighing, and packing corn to be distributed to food pantries and community kitchens throughout the five boroughs. Another one of our favorite activities was volunteering with the Pajama Program in 2015. The program provides new pajamas and books to children in need nationwide, many of whom live in group homes, shelters and temporary housing facilities. Volunteers had the opportunity to read to children from Pre-K and second grade classes, share snacks, and hand out pajamas and a book for each child. We loved working with kids so much that later that year we volunteered with Association to Benefit Children (ABC). We took a field trip to Battery Urban Farm and volunteers worked with two classrooms of three- and four-year-olds. We ate pizza. We rode the subway. We gardened… After we were done, we all needed a nap! In 2017, we volunteered with Coalition for the Homeless, helping wrap presents for children living in their network of shelters. The gifts were distributed to 140 kids at their annual Kids Holiday Party and to other children experiencing homelessness throughout the city. This one definitely put us in the holiday spirit! We did a second event in Spring 2017 working with God’s Love We Deliver, helping to prepare meals for individuals and families living with serious illnesses. We learned about their mission, put our hair nets on, and packed soup to be distributed across their network. This partnership has continued with a few additional volunteer opportunities in 2018, as well as planned events for this year. Another organization we’ve worked repeatedly with is The Friends of Governors Island. We’ve enjoyed helping them weed, rake, and maintain landscapes for this beautiful island we are lucky enough to work near. This work allowed us to give back in a way that is outside the scope of our day to day responsibilities and is vital to sustaining the public green space. 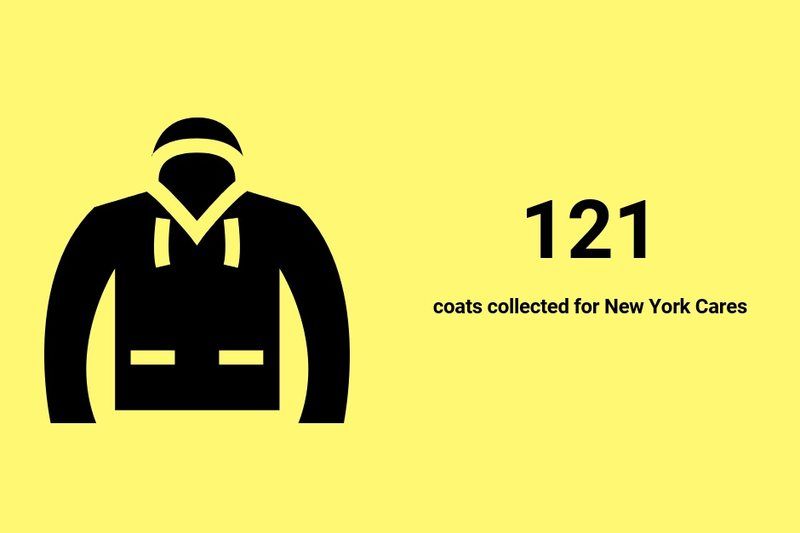 Collecting essential winter items (such as scarves, gloves, and hats) for youth in the Safe Haven for Children program as part of Lutheran Social Services of New York, Inc. Participating in Project Back to School with the Coalition for the Homeless, collecting grade-specific backpacks and school supplies for youth. In addition, we have an evergreen drive: With so many COA staff traveling across the nation representing COA at various conferences and events, we’ve made an ongoing effort to collect hotel-size toiletries to drop off at a shelter for survivors of intimate partner violence. 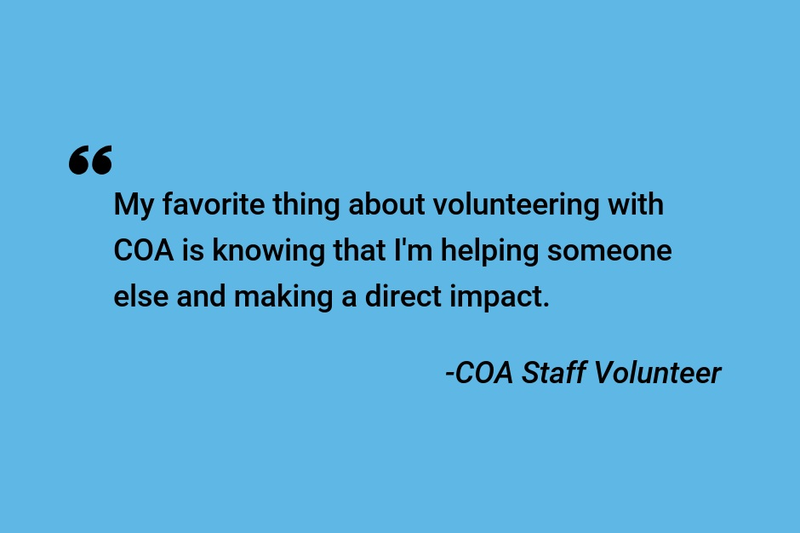 Since 2013, COA staff have volunteered over 400 hours through the COA Volunteer Committee alone! We’ve seen the impact both internally and in our community. Volunteering as an organization can give staff a forum to team build and bond, engage with the community, and increase morale. When we polled staff about what they like best about COA volunteer opportunities, promoting team-building and building camaraderie came out on top. Staff also appreciate that the activities connect back to our mission and provide a space for us to get to know one another outside of the office. Another thing that we enjoy about our volunteer efforts? They give us the warm fuzzies! What are the barriers to getting a volunteer effort off the ground? Our staff report conflicting appointments and time away from the office as the biggest hurdles. Finding the time to volunteer can be a challenge when you have a full plate. The activities themselves, the environment, or the level of physical activity required can be other factors that change the response from “Count me in!” to “Maybe next time…”. In the effort to keep our mission as a committee going and overcome these barriers, we’ve picked up a few tips and tricks to make our events more successful and have the greatest impact. Consider the nature of the event, time of year and weather in you planning - i.e. don’t plan an outdoor event if it’s commonly snowy that time of year. Keep in mind whether staff are typically on vacation or stacked with meetings on certain days. By making these considerations early, you’ll be able to maximize the number of staff that are able to volunteer for your event. When choosing a volunteer event for your organization it’s important to assess if there is an activity or event that is a particularly good fit for your organization. For example, our toiletry drive fit well with our frequent staff travels. You may also want to consider current events and needs in your area, like we did in our response to Hurricane Sandy. A key component of planning a successful volunteer event is getting buy-in from leadership to get the necessary permissions and gain their support and involvement. Engaging leadership at COA has enabled to us receive donations on behalf of the organization. Depending on the event and how your organization wants to contribute (time, items, $$$, etc. ), there are a few approaches you can use to utilize that donation to its fullest. For our last backpack and school supplies drive, we recognized that backpacks were the most expensive item we were asking staff to donate, so we used COA’s donation to purchase backpacks. If you’re planning a volunteer event that will require staff to make donations, it’s important to make it as convenient as possible for them. If the expectation is that staff will bring things in from home, highlight the convenience of being able to clean out and drop off at their workplace. If staff will most likely need to purchase items for donation, we highly recommended setting up a registry. It provides specific guidance and easy purchasing options for staff and allows the organizer the ability to manage the items donated. Though the joy of donating and contributing to a cause is often enough to get people involved, incentives can be a great way to engage folks and reward their participation. When soliciting staff to participate in an off-site volunteer event we highlight the opportunity for out-of-office time, an option to dress down, and even snacks or lunch. We’ve also conducted raffles alongside events, entering all participants in a chance to win a gift card. Be creative and know what will incentivize your audience. People forget. Particularly if it’s 7AM and you’re trying to get to work. Make sure to send frequent reminders! BONUS Tip: Even with reminders, we highly recommend allowing for some buffer time for sign up and donation deadlines (i.e. tell people the deadline is a few days before you absolutely need the commitment or donation). If your organization doesn’t have the capacity to plan a specific event, create an avenue for staff to learn about volunteer opportunities. We place information on a white board in our communal kitchen and have a Slack channel solely dedicated to volunteer information. This way staff can get the information and choose to participate on their own time if they wish. Whether you’re planning an event for your organization or doing something on your own, we hope you will get out there and volunteer this National Volunteer Month! This post is a joint effort of Isabelle, Sabrina, Marissa, Kerry, Devon, and Thomas. Thanks for reading!